I was going through my recipes the other day and saw this cake recipe that I haven't made in a long time. It is filled with warm spices and so moist it is almost like a pudding cake. This is a very easy recipe to put together and is great to have on hand when your friends are stopping over for cake and coffee after the game. 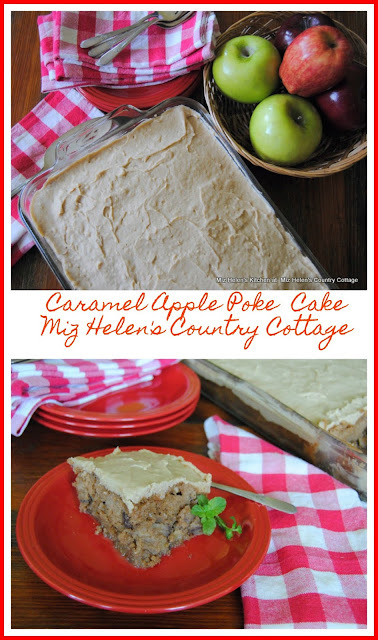 I use fresh apples in this recipe giving it a very rich consistency with the spice cake, caramel and little bites of apple, yes it is delicious! This cake is quick and easy to put together and gives rich flavor in return. I sure am happy that you could stop by to enjoy a slice of this Caramel Apple Poke Cake with me. Your visits are always important to me and hope you will come back to see me real soon! I am a huge fan of apple baked goods. This looks amazing! I haven't made too many apple desserts this year. This is one I know everyone will like. Sounds yummy, and I imagine it would work with a scratch cake as well? The memories see the poked holes brings back! I haven't had a poke cake in ages. I am going to have to make this today. Thanks!